Caleb’s Lion Costume 19, originally uploaded by StephLewis. Caleb was a Lion for Halloween this year. I made this costume for him out of fleece and ribbon. I made it a little big (with room to let out) so that he can still play in it over the next couple of years. 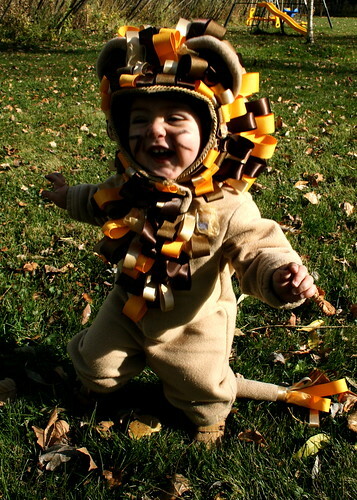 He loved being a lion and even got the hang of roar-ing towards the end. First we went to Grandpa & Grandma Whiting’s house and trick-or-treated there. They loved how cute he was with his little tail. Then we went to visit the Peterson & Lewis families in White Bear Lake. We trick-or-treated with Elise (a clown) and Maia (Robin Hood). Andrew & Karina (superman & wonderwoman) joined us for the first house, but then stayed back because we party to hard for them. So, Jon & Emily and Grandpa & Grandma Lewis all came with us trick-or-treating. When we were finished trick-or-treating, we went to Trinity Baptist where we played some games. Caleb enjoyed jumping in the giant inflatable dog, and also spent quite a bit of time pointing at the giant inflatable dog making “woof” sounds. All in all, we had a fun night out!